On Wednesday afternoon people from across the City descended on Blackburne House for the debut screening of the Give us 5 video. Produced by Jack-All Productions, the awe-inspiring film captures a glimpse of the power of reading for pleasure beautifully. Over the past few weeks organisations and individuals have united with City of Readers to dedicate their time to the project; Blackburne House generously donated the venue and Brian Patten kindly allowed his poem to be read, as well as those who offered their time to be featured in the video. Prior to the showing of the video, Director of City of Readers and our Founder and Director, Dr Jane Davis emphasised the importance of the work City of Readers do in their aim to make Liverpool the foremost reading city in the UK. Laura Lewis, one of our Schools Coordinators also shared heartwarming anecdotes detailing the impact reading has had on some of the children City of Readers work with. Last term City of Readers reached 579 school children in 17 schools and conducted 372 reading sessions. In one school staff saw 75% of pupils with poor attendance improving attendance, with 88% of pupils more willing to independently choose to read. Another school said that 79% of reading scores had gone up over the Summer, with 17% staying the same. This is fantastic as most reading scores plummet when children are away from school. The launch was an opportunity for people to learn about this worthy project, and to discover how they can get involved. City of Readers are delighted with the passion, dedication and enthusiasm shown by attendees to the launch. Amongst those who attended were representatives from Mersey Travel, Waterstones and Baltic Creative who all generously pledged to Give City of Readers 5 for reading. Esteemed author Frank Cottrell Boyce has donated 5000 words to City of Readers. The final chapter will be read live at the forthcoming Penny Readings in December. 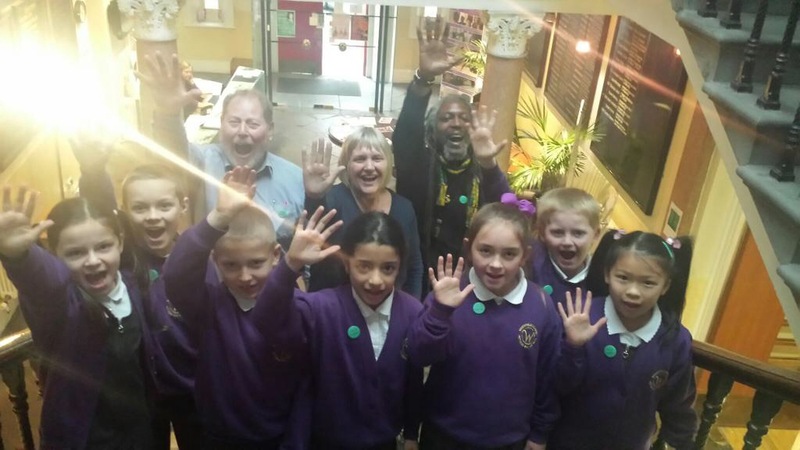 City of Readers urge everyone across Liverpool to get involved and Give us 5. So how can you pledge? Do you have 5 books that have been untouched in months? You could donate them to the City of Readers project. Or can you spare 5 minutes of your day and read to a loved one? For more ideas and details on how you can Give us 5, visit the City of Readers website here. You can watch the Give us 5 by following this link or scrolling down to our blog post ‘Give City of Readers 5 and some exciting news at Calderstones’.